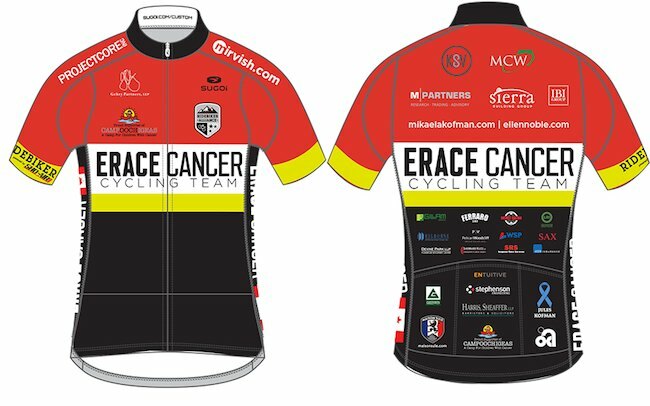 Erace Cancer Cycling Team p/b Ride Biker Alliance 2016 announces 4 day “Erace Kit Drive” closing March 3 in support of Camp Oochigeas and announces Team ambassador representation with Mikaela Kofman (Team Ridebiker – Liv) and U.S National Cyclocross Champion (U23) Ellen Noble. (Team Ridebiker – Focus). Erace Cancer Cycling Team p/b Ride Biker Alliance 2016 have chosen to support Camp Oochigeas . We welcome Pro Mountain Biker Mikaela Kofman (Team Ridebiker – Liv) and U.S. National Cyclocross Champion (U23) Ellen Noble as ambassadors to our team. They will represent this incredible charity and help us raise funds for cancer programs as they race their respective seasons and travel the globe in 2016. Erace Cancer Cycling Team has joined with the extensive Ride Biker Alliance, a group of 4000 riders, to raise awareness and to extend our fundraising activities. Over the past 4 years Erace Cancer Cycling Team has raised over $250,000 for “OOCH” ..Once again we have amazing support from a group of new and returning team supporters and sponsors. Now you can help us and buy a kit in our annual “Erace Kit Drive”. For the next 4 days only you can buy our kit and support kids cancer programs at Camp Oochigeas. You can buy this gear whether you race or ride for another team or club or not. Please buy a jersey, shorts or other articles of clothing in the next 4 days and it will help us reach our 2016 fundraising goal! Deadline for our first order is March3, 2016. Please help us and order at fantastic prices before the deadline on Thursday!